Posted by Sara MacLennan on Friday, April 10th, 2015 at 9:58am. The MEC Edmonton Race One will be held on April 12, 2015 in Goldbar Park. This is a road-style race that is expected to have as many as 500 participants. You can choose to run a 5K, a 10K or a 15K if you are up for the challenge. While this is a smaller race, it will have chip timing and recovery snacks at the end of the race. On April 25, 2015, you can participate in the Run, Walk, Ride 4 Traffic Safety. This is special event that runners, walkers and cyclists alike can participate in, and the event is held at Concordia University College. All proceeds from the event will support the Memorial and Traffic Safety Fund, which supports awareness for traffic safety for the community. 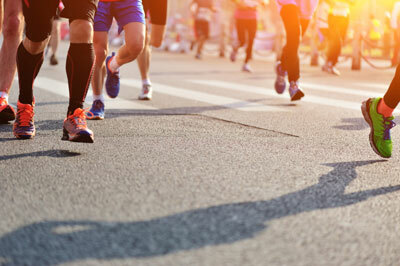 This is a family-friendly event that includes a 10K run, a 5K run or walk, a bicycle race and even motorcycle festivities. The Edmonton Police Foundation Half Marathon marks the official beginning of the spring marathon season in Edmonton, and it is hosted by employees of the Edmonton Police service. It will be held on April 26, 2015 at Hawreluk Park. This event is open to the public, and proceeds support several local charitable organizations. In addition to the half-marathon, there are also 5K and 10K runs available for participants to compete in. The Kidney Run & Walk will also be held on April 26, 2015, and proceeds from this event will support the Kidney Foundation of Canada. It will be held at the ACT Centre in Rundle Park, and it is a family-friendly event suitable for all ages and all physical ability levels. There will be a 2K walk as well as 5K and 10K runs. The routes are wheelchair accessible. These are a few of the many races that are scheduled for the near future in Edmonton. Regardless of your current physical condition, you can find several races that you can participate in that are ideal for you and that support great causes. You can research these and other events today, and you can sign up for the races of your choice online.